Clubbing has been playing an important role in the life of the young people for many years. Back in the 70s, at the dawn of clubbing culture, the only thing a club needed to do for earning a special status was throwing the best parties. The situation is quite different in the modern world. 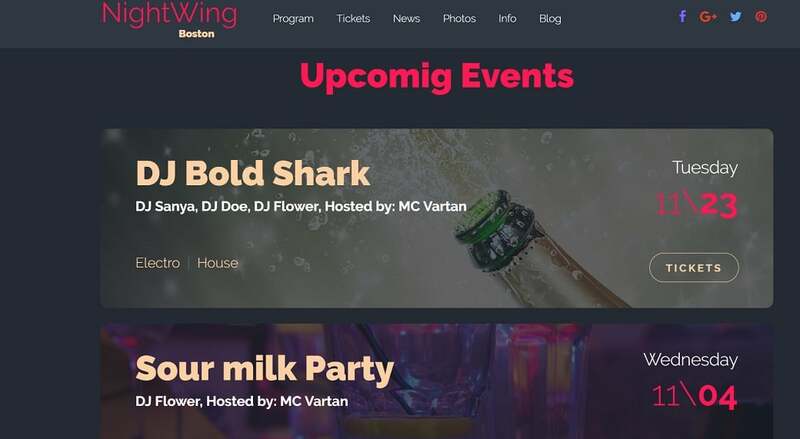 To triumph over its competitors, a present-day club requires a number of things starting with all sorts of fancy add-ons and awe-inspiring design to inviting well-known DJs and offering extravagant drinks to the clients. 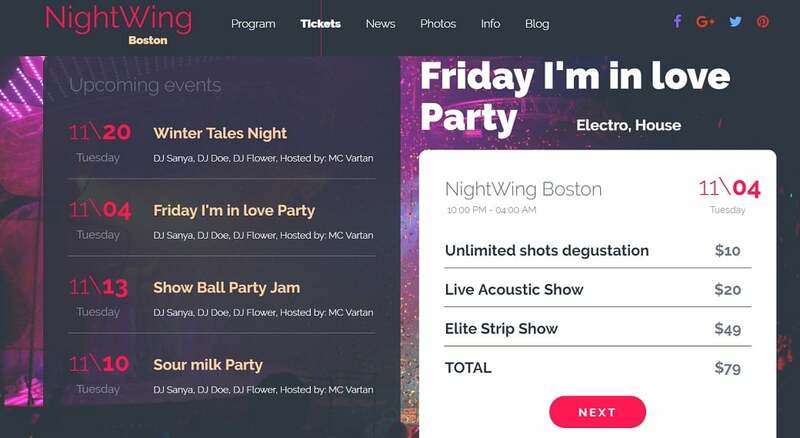 In this article, we will provide you with a no-nonsense guide on how to make a night club website yourself, using gorgeous night club website templates. To look like something from a sci-fi film is not enough for a place where people like to rave nowadays. The youth of today is the Internet generation. This obvious fact means that being involved in clubbing business one cannot cope without a website to represent it online. Otherwise, young clients will never go to the place which does not exist online thinking it to be no more than a bummer. 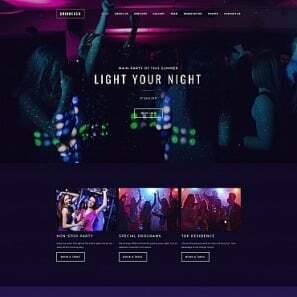 MotoCMS is well aware of this necessity and that is why we have created a number of breathtaking nightclub website templates to choose from. 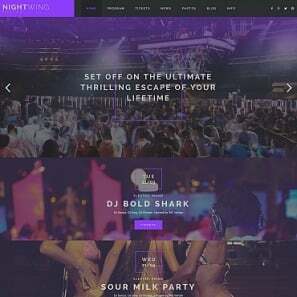 To discover how to make a night club website of your own, you only need to pick the template you like most and to customize it. The whole process of launching a new stunning website will take you only several hours! Sounds great, isn’t it? To make your website even more successful, take into consideration the following practical pieces of advice that we mention below. 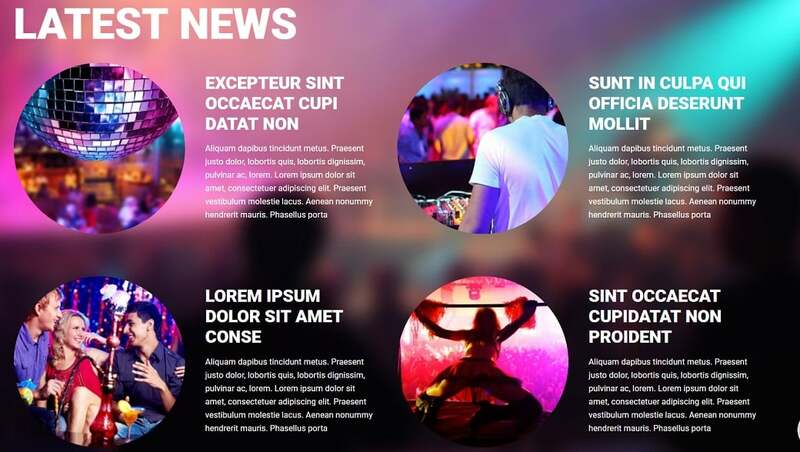 The most salient aim of your website is to inform the visitors of your club about upcoming events. Pay extra attention to the design of the advertisements. Use mesmerizing color combinations and contrasts. Make the images grabbing and intriguing. Try to devise intricate headlines which will certainly raise the audience’s curiosity and urge people to come and see everything with their own eyes. In the modern world, all night clubs face a serious competition. Under the circumstances it is wise does not concentrate only on one type of activities. Be inventive and widen the specter of services you can offer your prospective clients. Thus you will beat the rivals in the business. For example, organize a dancing school for those who want to improve their dancing skills or offer special courses devoted to cocktail making. Improvise and succeed! Blogging is an essential part of the young people’s world. It goes without saying that you need your share of the public’s attention this sector can offer. A blog of your own will help in keeping the audience interested in your website and your club’s activities. Use this possibility to demonstrate how exciting it is to be a member of your community and participate in all the events that take place in your club. Galleries are also extremely useful for you because they offer a wonderful means of popularizing your place. A number of bright pictures featuring smiling young faces full of life and energy will make your visitors strive for becoming one of them and experience the same inspiring emotions. MotoCMS proposes you different types of galleries for your website. Use them and turn your website into a spectacular sight. Establish a convenient system for selling tickets. Introduce pleasant discounts for club card owners. 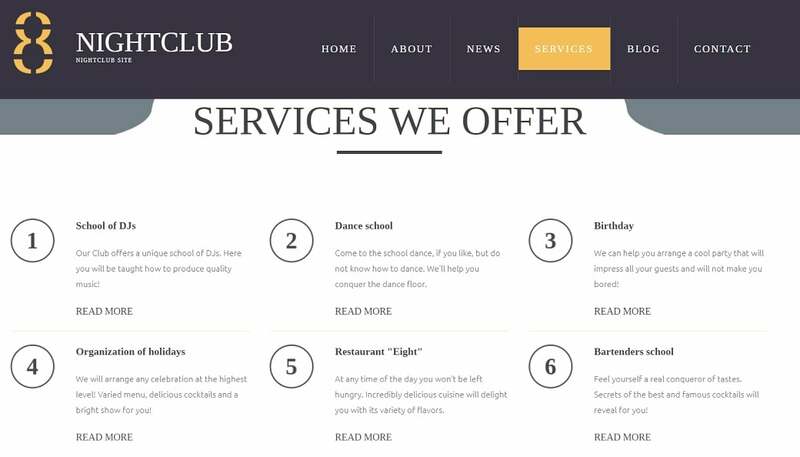 Create special birthday offers for encouraging people to celebrate birthdays at your club. Think about organizing interesting competitions among the visitors and offer tickets to the new events as prizes. 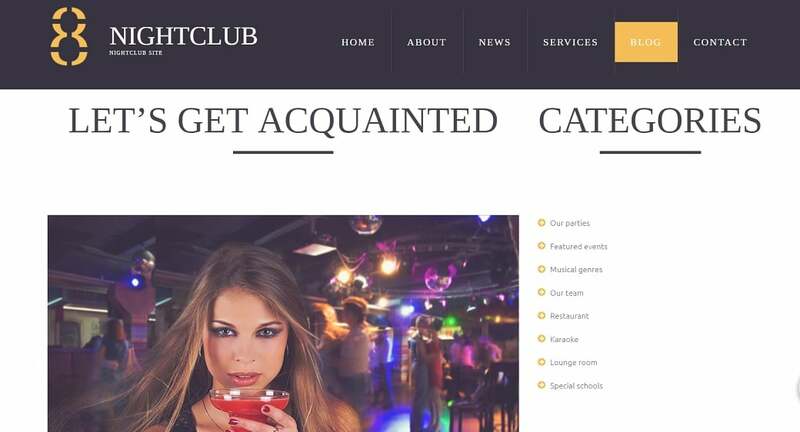 If you want to understand how to make a night club website that matters, consider using your site as a way to find new staff members. Leave the information about current vacancies there. There is always a chance that one of your young and energetic guests may become your loyal staff member. A nightclub is a place where people are raving and relaxing. As a result, quite often a lot of personal belongings are lost here. 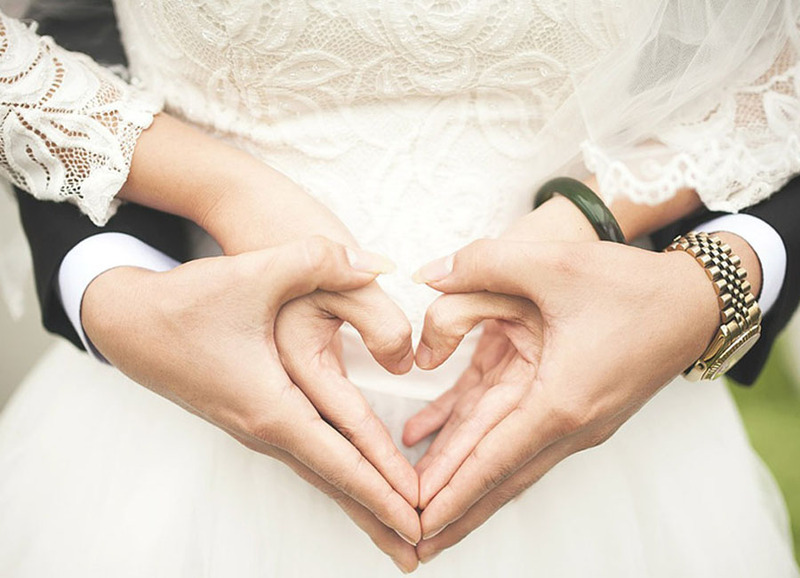 Help your clients in this unpleasant situation by introducing a special website section where they will be able to find all the information about lost and found things. Share the latest news with your visitors. Demonstrate that the life is rapid and quickly changing in your club. But in order to achieve this effect, you should keep your news varied and really new. Of course, keeping the news updated on time requires a lot of effort and time. But believe, it is worth doing. Upload the popular mixes played in your club. Let the visitor listen to their favorite music compositions online. MotoCMS templates provide you with a convenient audio player to listen to any piece of music you want to include. Last but not least, take care you are easy to contact and your club is simple to find. Give all the detailed information on your website. Offer links to follow your club’s activities in the social networks. To give different contacts for different needs is not a bad idea because this way you will simplify the work of your staff. 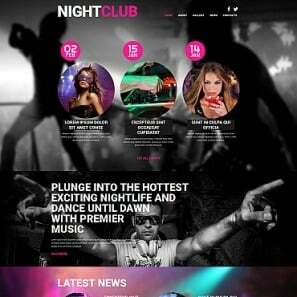 Choosing any of nightclub templates from MotoCMS will raise the popularity of your club considerably. Besides that, there is no need to decide on the theme at once. You have 14 days of a free trial period to think over this awesome offer. 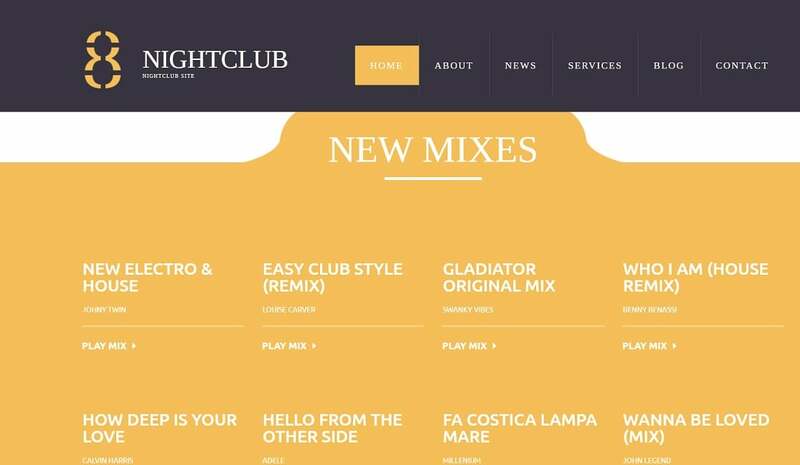 Well, now you know how to make a night club website! 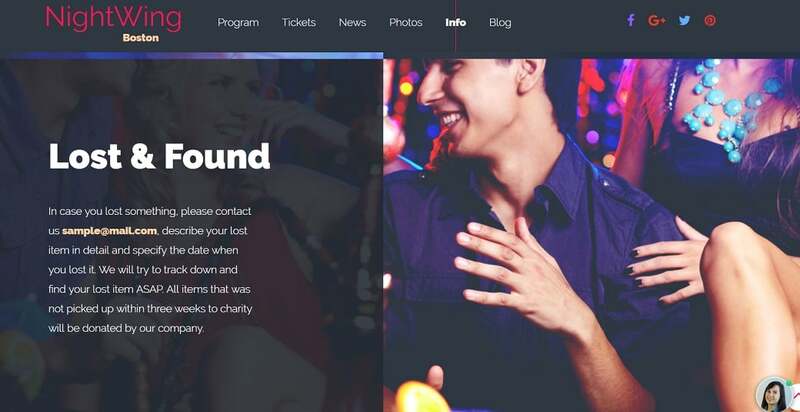 So, do not miss your chance to join successful nightclub owners that earn millions, create your site by yourself!